The UNE Business School warmly congratulates Hayley Simpson (BBus/BLaws) in being awarded a prestigious scholarship to study a Master in Law at Zhejiang University, Hangzhou in China.This opportunity follows Hayley’s success in receiving a UNE Foundation Scholarship to participate in the UNE Business School China Study Tour in 2014. While she says the ‘experience of culture shock was extreme’ she took the opportunity to apply for a Master of Laws earlier this year to ‘further my knowledge of other cultures and to enjoy living with new people in a new country’. ‘I feel this is going to be an experience I will never forget, it will improve me academically, socially and culturally as it paves new avenues for career opportunities, fun experiences and making new friends,’ Hayley said. ‘Whether you are in your first year or last year, I encourage everyone to look for opportunities and to not be afraid when applying. Challenging yourself leads to growth and may take you on an amazing adventure’.Hayley leaves to take up her scholarship in China at the beginning of September. 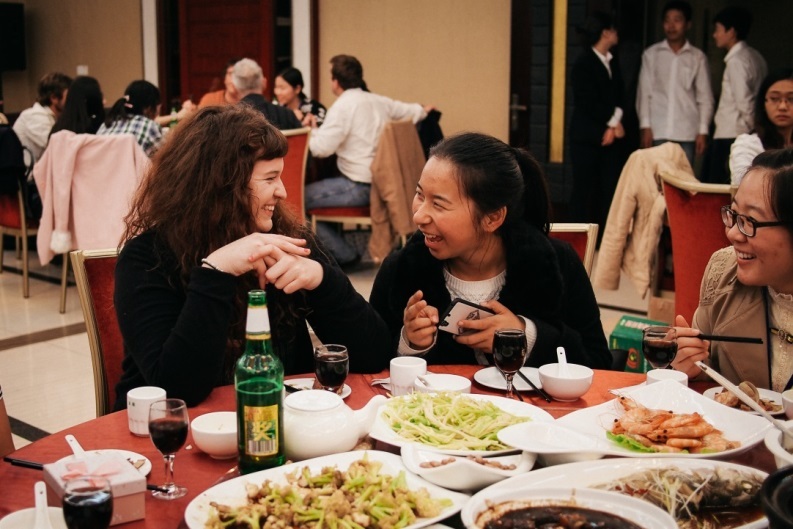 Hayley Simpson pictured here with students from Shandong Institute of Business and Technology, Yantai, China, 2014.